Who is the best actress? The name Julia Roberts answers that question. Throughout her storied career Julia Roberts has delivered iconic performances. Let’s celebrate her filmography. She’s appeared in Academy Award winning titles seemingly as a hobby. Movie industry experts respect Roberts because she respects her profession. Julia is highly trained and gifted. Critics come out the woodworks and write a review when she plays in a movie. Secret in Their Eyes saw enormous criticism (no pun intended) because it was deemed a “Julia Roberts” film. In other words, expectations are heightened and fears are lowered. Ever since Pretty Woman, the beautiful actress has been expected to perform to perfection. Usually, Julia comes through on promises. She went from a promising career to a promised career. Producers give her the star treatment. And the celebrity’s fans worship her. What woman, pretty or ugly, wouldn’t want to be Julia Roberts for a day. Her niece Emma Roberts is extremely lucky. Julia seems like a genuine and kindhearted human being. You hardly ever hear about the celebrity body slamming Paparazzi. Maybe, she lets her bodyguard do the manual labor. That’s his job, right? Being Julia Roberts entails major responsibilities. She’s a wife and mother of three. No, she doesn’t have three husbands although she could find two additional partners because her name is Julia Roberts. Check out the following video and you’ll see the perks of being Julia Roberts. I’ve seen several of the passionate thespian’s films. I’m quite familiar with her filmography. My favorite Julia Roberts movie is The Pelican Brief. It is a well-written script. Plus, the acting is incredible. Moreover, I recommend seeing Mona Lisa Smile, America’s Sweethearts, and Eat Pray Love. Finally, Erin Brockovich is an absolute must-see movie. Ironically, I believe The Pelican Brief prepared Julia for the Best Actress Oscar. If you desire to become famous, follow Julia Robert’s footsteps. Sometimes you’ll stumble but falling is necessary in order to grow. Get back up, dust off your shoulders, and keep on going. Reese Witherspoon is one of Hollywood’s hottest actresses by design. She was destined for greatness. It was only a matter of time before her name would shine in big bright lights. The glowing Hollywood star can play the country girl or the city hipster. I enjoy watching Reese Witherspoon because she desperately desires a second Oscar. Although she earned Best Actress 10 years ago for Walk the Line, the devoted actress is long overdue another one. Unfortunately, Hollywood has a political agenda. The Awards committee is always trying to make a statement. It’s not about who’s the best anymore. It’s more about who serves their cause the most. Reese Witherspoon deserved an Oscar for Wild. Despite continual unfairness, Reese takes losses like a champ. The Legally Blonde just makes another case for the Academy. I highly recommend Mud starring Matthew McConaughey. Witherspoon is a fantastic supporting actress. She stirs up emotions like Grandma’s gumbo. What’s her secret sauce? The mother of three can relate to her characters. She isn’t too far removed from reality. Reese Witherspoon was one of Hollywood’s highest paid actresses for many years. In 2010, the gorgeous star earned a grand total of $32 million according to Forbes. She still commands a hefty salary because she is a producer and actor. Studio executives recognize Reese’s star power too. In addition to name recognition, her face is instantly recognizable to millions around the world. Speaking of millions, the Richest estimate that the How Do You Know? actor’s net worth is $80 million. That’s a lot of cheddar considering the cost of living in Hollywood is sky high. Fortunately, Reese Witherspoon isn’t splurging on nonsensical and nonessential material goods. She seems to have a good head on her shoulders. Hopefully the mature actress can knock some sense into these newbies. It’s difficult living large like a celebrity. You need to watch your business manager, accountant, lawyer, and doctor with suspicion. Don’t trust anybody but your mother. Reese Witherspoon is in the upper echelon because she’s smart. Plus, she chose great movies to star in and is an expert performer. The stunning beauty is absolutely amazing. Anna Faris carved her career path with a machete. She started professionally acting in Hollywood after auditioning for Scary Movie. In fact, Scary Movie was her very first audition. Actors deal with rejection on a regular basis. Moreover, an actress rarely receives a callback after only one audition. That’s why Anna Farris is scarce. Celebrities must subscribe to the foot in the door strategy. I call this the Hollywood Hokey Pokey. “You put you’re right foot in, you take you’re right foot out, you do the Hokey Pokey and you turn yourself around and that’s what it’s all about.” Becoming famous like Anna Faris simply involves taking steps toward your goals. Although Anna Faris was born in Baltimore, Maryland, she was raised in a small town near Seattle, Washington. Eventually, Anna arrived at Tinseltown with a dream. Showbiz provides abundant opportunities, although the likelihood of someone striking riches is slim. Luckily Anna disregarded the statistics and overcame the odds. The actress possesses a burning passion for theatre. This thespian’s skills are underestimated. She can play comedic roles and serious parts. Farris deserves recognition for her performance in Brokeback Mountain. She is known for making you laugh and cry like Kate Hudson by playing stereotypical roles such as the amazingly attractive but dumb blonde. In reality, Anna Faris is a bright brunette. Locking down husband Chris Pratt was a smart decision. It goes both ways because Pratt is fortunate to have married the sweet and kind Hollywood actress. Additionally, she is a good reason why he’s such a hot commodity. Girls like Anna Faris are scarce. Right now she is probably in the kitchen cooking a Rachael Ray recipe and rehearsing lines with Chris. The celebrity likely has Martha Stewart’s phone number on speed dial. The House Bunny runs her home efficiently. Anna is a good wife and mother. If you’re an aspiring actress, entertainer, or celebrity learn your lesson from Anna Faris. She is confident in her techniques but she isn’t smug. And she’s always ready for her close-up. Tina Fey and Amy Poehler cohosted Saturday Night Live recently. Two hosts for one show is a rarity for SNL. When Tina and Amy combine their talents it’s a wonderful sight. We’re walking in a Winter Wonderland! I am a comedy connoisseur. I indulge only in the finest. I can attest to Tina Fey’s richness. Funny girl Tina Fey performs at full throttle. Like a Charlie Angel, she is hot and well equipped. Expect the purest quality from Fey. She should get a show similar to John Oliver and Bill Maher. I thoroughly enjoyed Tina Fey’s Weekend Update. 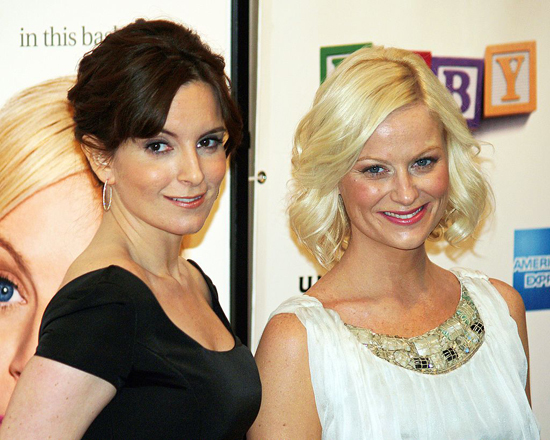 That’s when Fey and Poehler first formed a bond. Can you imagine Tina replacing Ellen DeGeneres on daytime TV? Did you know Upper Darby is her hometown? That’s close to West Philadelphia, where Will Smith was born and raised. Don’t you love her satire? Styles win over smiles in showbiz. By working smart Tina Fey built a geeky brand. Moreover, Tina keeps making funny movies. The Sisters movie receives high marks. The wife and mother of two children starred in Baby Mama alongside Amy Poehler in 2008. If you’re considering dinner and a movie, I highly recommend Date Night. Steve Carell couples with Tina Fey and they put on terrific performances. Mark Wahlberg makes a memorable appearance flexing his muscles and cracking computer codes. Laughter is the best medicine. And Tina Fey is the head nurse of comedy. Although doctors take all the credit, everybody knows nurses save the day. Right now I believe this comedic actress is at her absolute best for she’s a jolly good fellow, which nobody can deny! The celebrity could reasonably rest on her laurels. However, she chooses to continue blessing the masses with her work. You must admire her career achievements. I appreciate her dedication, consistency, and maintenance. She is built Ford tough. What is better than watching Tina Fey accelerate at full throttle?